Everyone knows Cheers as the bar "where everybody knows your name." But did you know that that is also true of our sister restaurant, 75 Chestnut? 75 Chestnut, known as the gem on Beacon Hill, is a cozy Beacon Hill restaurant featuring regional American comfort food. Tucked away amidst the brownstones on one of the most charming streets in Boston, 75 Chestnut is nestled in the city's historic Beacon Hill. But if you're reading this blog, you probably already know that. And you also know that one of the most important elements of what makes 75 Chestnut so great is the staff. Time and time again we hear from guests that they enjoy visiting us because of the personal and intimate feel our restaurant has. It is a favorite among locals! Always welcoming to new guests and returning regulars alike, our staff is the frosting on the cake that is 75 Chestnut. Let's get to know them, shall we? 75 Chestnut is owned by Mr. Thomas A. Kershaw, a resident of Beacon Hill since 1964 and owner of the Hampshire House on Beacon Street since 1969. Over the 30 years in the restaurant business, Kershaw has been involved in operations in Boston, Marblehead, and Salem and has served as the President of the Massachusetts Restaurant Association, and Chairman of the Board of the National Restaurant Association. 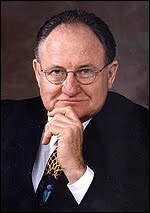 His many awards include: Restaurateur of the Year (1984); Humanitarian of the Year, Project Triangle (1994); Man of the Year, Greater Boston Association of Retarded Citizens (1996); Distinguished Eagle, Boy Scouts of America (1999); and the Boston Patriot Award by the Freedom Trail Foundation (2001). Since 75 Chestnut’s founding in 1997, Markus Ripperger has served as the culinary mastermind behind the neighborhood restaurant’s success. Classically trained in Zurich, Markus specializes in carefully weaving hints of his Swiss roots into new dishes in his distinctly New England setting. His oven-roasted lamb rack, Nantucket seafood stew and porterhouse pork chop showcase the impressive breadth of his abilities. While Markus often draws on old world delicacies for inspiration, he is an innovator in 75 Chestnut’s kitchen. Markus’s tenderloin with blueberry peppercorn sauce, roast leg of wild boar, and venison medallions delight his guest’s taste buds with their unique flavors. Markus’ delectable chocolate soup, which he crafted for Boston’s 1997 Old Town Trolley Chocolate Tour, especially highlights his innovative spirit. Markus aims to make every guest experience at 75 Chestnut more than just a memorable meal, but also an opportunity to celebrate life, love and good health. 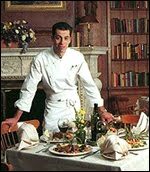 Before he served as executive chef for 75 Chestnut, Markus presided over the dining rooms at Boston’s Colonnade Hotel, Sheraton Hotel and Swissotel. In Europe, Markus mastered his trade at La Napoule, France’s famed Restaurant L'Oasis and London’s Savoy Hotel and Grosvenor House. Since 1992, Markus has also overseen the menus at the Hampshire House and both Cheers locations, where he is a proud industry leader in eco-friendly and sustainable cooking practices. In 2007 he was promoted to Vice President of Operations of the entire Hampshire House Corporation. Betsy is a native Bostonian. She was born, raised, and attended school in the city. With a strong desire to keep a finger on the pulse of the vibrant city of Boston, Betsy has always enjoyed the pleasures of delicious food, refreshing drinks and interesting conversation. Hospitality was a natural fit for her career. Osmar Pauletti, a local expert on value wine, is a ten-year veteran of 75 Chestnut. Most passionate about the Rhône Valley wines he warmly recalls drinking on his first date with his wife, Osmar also appreciates Spanish wines for their impressive quality and value. During his 11-year tenure in the restaurant industry, Osmar has come to appreciate wine’s colorful history and deep tradition, as well as the friendships he’s developed over bottles of wine. Osmar was bred to be a wine lover. He fondly remembers his younger years when – alongside his mother’s polenta and ossco bucco – he savored his father’s handcrafted wine. 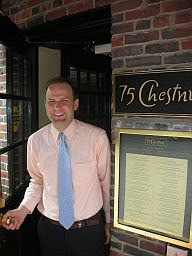 Today, he uses his seasoned tasting abilities to recommend selections from 75 Chestnut’s vast selection of fine wines. Most recently, Osmar has recommended the Oyster Bay SB. “Young ladies seem to love the crispy acidity and grapefruit notes of this SB from New Zealand,” says Osmar. Edgar Oliveira was raised on the southeast coastal valley of Brazil, where the first Portuguese arrived in the 1500s. He was first drawn to manipulating tastes and flavors by the sugar cane, artesian-crafted cheeses and dark-roasted coffee of his homeland. His culinary abilities were born in his mother’s kitchen, where he worked with many of Brazil’s natural and sustainable foods. 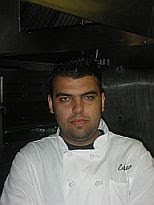 Since 2001, he has put his expertise to work at 75 Chestnut, where guests rave about his creative specials and local favorites. Edgar’s organic upbringing inspired 75 Chestnut’s environmentally friendly “Green Thursdays.” An innovator in the kitchen, Edgar has a passion for creating and developing new flavors. Summer in the city means many things. 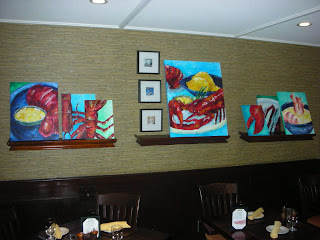 For 75 Chestnut regulars, we know that one of those fabulous things is Lobsterfest! Lobsters have long defined summer all over New England. Many locals feel the season has not begun until they have enjoyed their first delicious lobster! 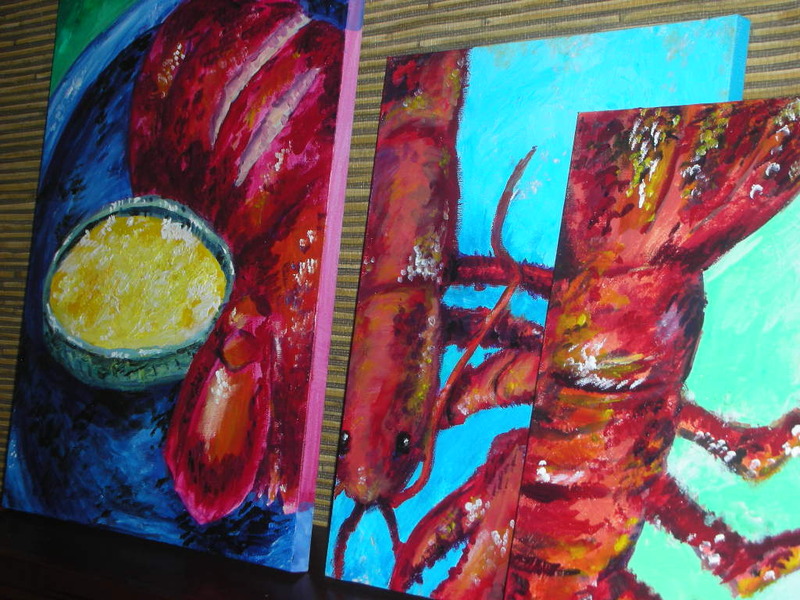 Every Saturday in July, 75 Chestnut celebrates summer with classic and innovative lobster creations. We also serve selection of refreshing summer drinks (such as our famous Sangria) and our full menu. 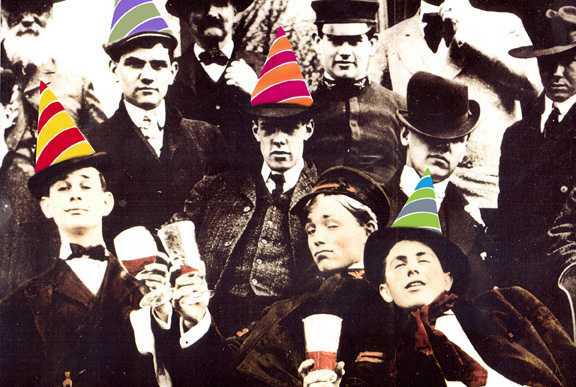 But we wanted to find a way to celebrate this delicious creatures in more ways than one. 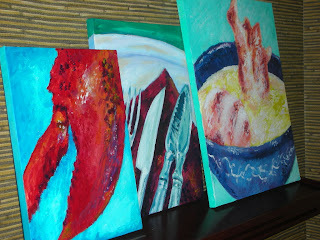 This year, we joined forces with local artist Katrina Wilbur to make something truly unique for guests! Katrina Wilbur is a 20 year old Illustration major at Massachusetts College of Art and Design. 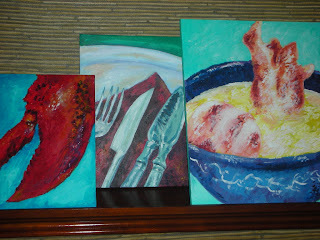 A bit of a "jack of all trades," Katrina is interested in many different kinds of illustration. Katrina's main focuses are painting and children's style illustrations. 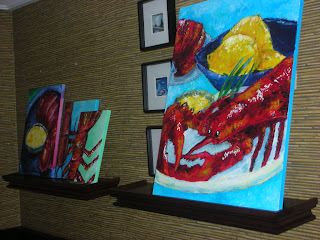 For this month only, 75 Chestnut will display one-of-a-kind lobster paintings by Katrina. Guests may purchase these paintings while visiting our restaurant. All proceeds will benefit our Cheers for Children charity. Visit us this month to bring home a piece of 75 Chestnut! Looking for an artist to capture your image at your best? Cheers Faneuil Hall has caricature artists from Fun Enterprises coming in every Thursday, Friday, Saturday and Sunday to add our summer fun! Here at Cheers Beacon Hill, we're starting off the day a little earlier every Saturday and Sunday in our Set Bar so join us for brunch beginning at 10 a.m. 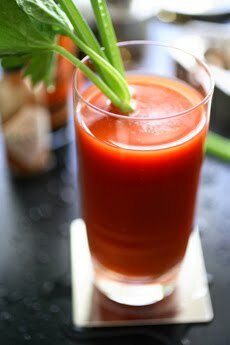 Try Norm's Omelet with his famed, award-winning Bloody Mary or Carla's Scramble and a mimosa to get your weekend rolling!